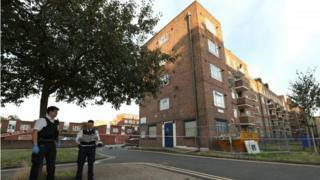 Two men have been killed and four boys hurt in separate stabbings across London. The four boys, aged between 15 and 16, were attacked outside Landor House on the Elmington Estate in Camberwell on Thursday evening, police said. A 42-year-old man died after he was found with stab wounds at an address in Flaxen Road, Chingford, at about 04:40 BST on Friday. Hours later, a man in his 50s was found dead at a home in Walworth. One of the boys, who was in a critical condition after the Camberwell attack, is now said to be in a serious but stable condition. A 15-year-old boy was charged with possession of a bladed article and possession of cannabis following the incident on Thursday. He was bailed to appear at Camberwell Youth Court on 5 September. Five other boys, aged between 15 and 16 and held on suspicion of violent disorder and grievous bodily harm, were bailed to return to a south London police station in mid-September. An eyewitness described seeing one boy with severe wounds to his abdomen. He was seen running around the corner of the building before dropping to the ground. Witnesses said they heard a teenager shouting "help, help" before police arrived at about 17:30 BST. One local mother, who did not want to be named, said she saw a boy carrying a blade more than a foot long. "I could see the knife in his hand, I could clearly see the blade, it was big and that was worrying me," she added. "My little boy is growing up around here, it's terrifying." Another woman said she saw "lots of blood" and a "massive" knife on the ground after the violence. A 16-year-old boy and a 35-year-old woman have been arrested on suspicion of murder over the death in Flaxen Road, Waltham Forest. The man found injured died at the scene 05:22. His next of kin have been informed, police said. A Met spokesman said officers were not looking for anyone else in connection with the murder investigation. The second fatal stabbing victim of the day was found at about 14:00 at a home in Madron Street, Walworth, about a mile from the Elmington Estate. The Camberwell stabbing on Thursday was one of many violent attacks in the neighbourhood in less than four months. In July a 17-year-old girl was knifed to death in Brisbane Street, a five-minute walk from Landor House. Rhyhiem Ainsworth Barton was found with fatal gunshot wounds on Warham Street in May, while his friend Sidique Kamara was stabbed to death on the same street on 1 August. Harriet Harman, Labour MP for Camberwell and Peckham, told BBC Radio London: "It's absolutely dismaying that this has happened again. "Not only is this really a tragedy for the families, when young men, so young, are involved in this sort of crime... But it creates real shock in the local community." There have been more than 90 violent deaths in the capital this year so far.